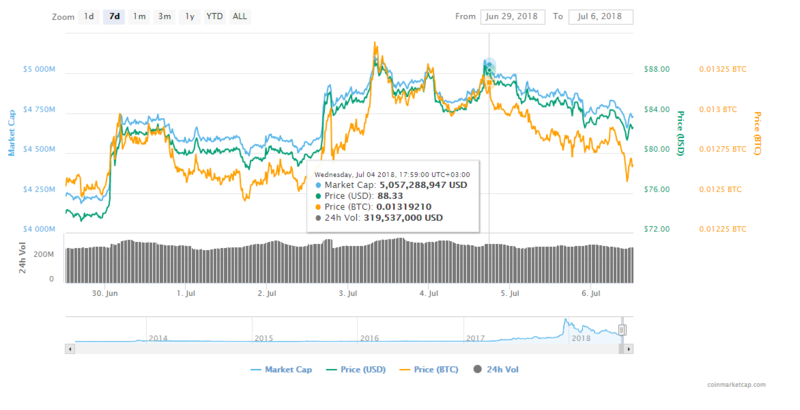 Yesterday was quite a sad day for Litecoin because we all saw its gain being clipped by 10% down from 14% earlier this week. Litecion bulls are not standing on the most solid ground these days, and this could trigger a reversal of the July 2 gains. 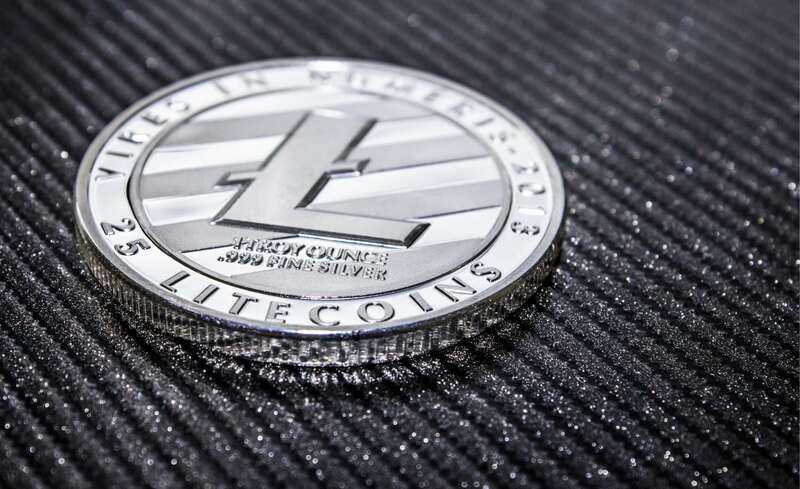 Litecoin’s prices have been on a one-way slide since testing their highs back in 2017. There are various theories that claim to explain this whole depreciation of the crypto, but one thing is sure: this loss will not be without end. 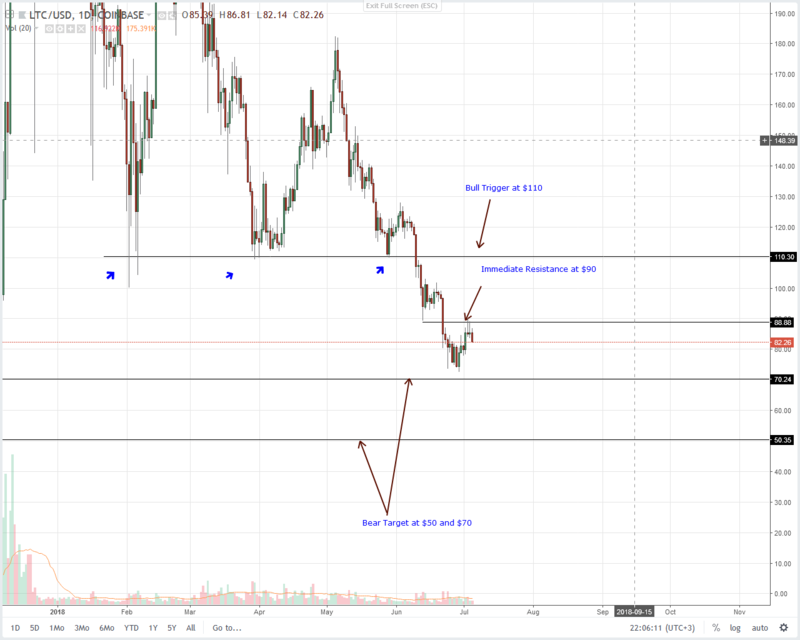 In June, LTC traders have pushed the prices below $110, and the volumes and size of the candlestick pointed out to a typical bearish breakout. A bear break out is usually followed by a pullback and this week may very well mark the beginning of a pullback for Litecoin, retesting $110. This could also hint to LTC bulls coming back into the picture if there’s a strong break above the $110 and later $130. Considering this whole technical set up and last week’s rejection of lower lows this week may end up bullish. There are some pretty nice higher highs bouncing of the double bar reversal candlestick on June 29-30 and on July 2. Buyers have rejected low prices, and they aimed higher. Even if yesterday’s lows were not good news, the only thing that would be able to cancel the bullish prediction mentioned above would be a dip below $70. Currently, prices are inside the July 2 high lows, and they are clearly rejecting $90. Today, we might even see prices adding to their losses, and despite this, we may as well maintain the bullish hope until the short trade conditions are met or at least until prices bolt above $90.